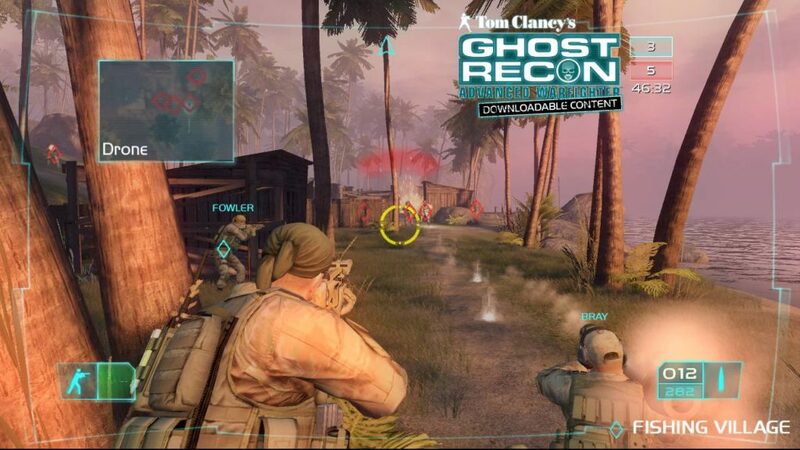 Tom Clancy’s Ghost Recon Advanced Warfighter is the third game in the Ghost Recon series. Each of the games has improved over the original, and this one is no different. With new gameplay mechanics like the Cross-Com, a much improved cover system, and breathtaking graphics, Advanced Warfighter is a worthy sequel and a true next generation game. The story takes place in modern day Mexico City. In the game you play as a man by the name of Scott Mitchell who is the captain of an elite light infantry unit called the Ghosts. You are there to provide security during a meeting between the leaders of the United States, Canada, and Mexico. It is during this time that some Mexican insurgents decide to attack the meeting in an attempt to come to power. They kill the Canadian prime minister and the US and Mexican presidents disappear. Your job, among other things, is to locate and rescue the US and Mexican presidents. You won’t be fighting alone for most of the campaign. You will have three teammates which you can order around for the majority of the missions. You can order them to attack, fall back to you, and move into certain positions. While the way you command them is not exactly deep or provides a lot of control, you can still be pretty effective with your squad. Your Cross-Com allows you to see what one of your teammates sees, allowing you to get multiple perspectives of the battlefield. Unfortunately, the squad AI can give you a bit of a headache sometimes. While they are usually pretty good at shooting enemies, it’s not too uncommon to find your teammates exposing themselves too much instead of properly using cover. For the most part they do try to use cover whenever possible though. Besides your three teammates, some missions give you other assets to control. One of which is a UAV which you can order around the level. The UAV can detect enemy troops and mark them on your HUD. Since you can die pretty fast in this game, knowing where the enemies are and planning your next move is essential, and having a working UAV helps greatly. Occasionally you will also have a tank or helicopter gunship. The tank can not only be used to attack enemies but it can also be used as cover while it moves. The helicopter is also pretty good and moving and striking targets on the ground quickly. During a few sequences in the game, you will actually get to fly around in the helicopter and use the machine gun on the side to take out huge groups of enemies. While these sequences are not too challenging, they are a lot of fun. Because a single good shot can kill you in Advanced Warfighter, the game has a slower pace and more tactical feel then other action games. That is not to say that the game is dull; it is filled with fierce fire fights and big explosions, but it does require more thinking then some other games. You always want to lean around corners before going walking out in the open, and always fight from behind cover. Since the levels are pretty large (many city blocks for each level), there are usually multiple ways to get to each objective. Most of the time just taking a different route will end up in a totally different experience. Enemies roam the map, also making sure the game never plays exactly the same way twice. The amazing graphics are probably the first thing you will notice when you load up this game. The amount of detail in objects and the size of the city are staggering. During the game’s many helicopter rides, the city buildings and streets stretch out for mines in every direction. Sometimes you can see areas filled with fire or smoke from all of the fighting that has been going on. These sequences do a great job of making you feel that you are in a real city fighting in a real conflict. Mexico City just looks absolutely beautiful. Advanced Warfighter is easily the best looking game on the Xbox 360 console. The HDR lighting is used to great effect in all of the games missions, which range from early morning, afternoon, and dusk. During some of the afternoon missions, the sunlight can get so bright that it actually makes it hard to see. The character models are some of the best that I have seen. They are all extremely detailed and look very realistic. They also animate in a very believable way. The only negative thing you can say about the graphics is that things will sometimes “pop” into view when leaning around the corners. This does not happen often, but can take you out of the game for a moment when it does happen. The audio in the game is also great. All of the guns sound different and extremely clear. Explosions and tank and rocket fire sound great as well. The game also muffles the sound when explosions go off around you. The music in the game is also pretty good and comes in at the right moments. The voice acting, while not amazing, is convincing. While the single player game is great, the multiplayer is what’s going to keep people playing. The game features three ways to play multiplayer: local play, system link, and over Xbox live. There is a large selection of game types to choose from. First, there are the excellent co-op missions which are a blast to play with your friends. Then there are the more standard game types you are used to like capture the flag and deathmatch. Besides those default settings, the game allows you to customize your game to play the way you want to. The multiplayer experience is extremely addictive and plays very well. I definitely expect people to be hooked on this game for a very long time. Overall, Ghost Recon Advanced Warfighter is a great game. Offering an intense single player campaign and multiplayer matches which will remain fun for hours at time, Advanced Warfighter is a great complete package and sets the bar pretty high for the inevitable sequel.